A Client who want’s to consume a REST endpoint to list the movies catalog from the cinema corporation. 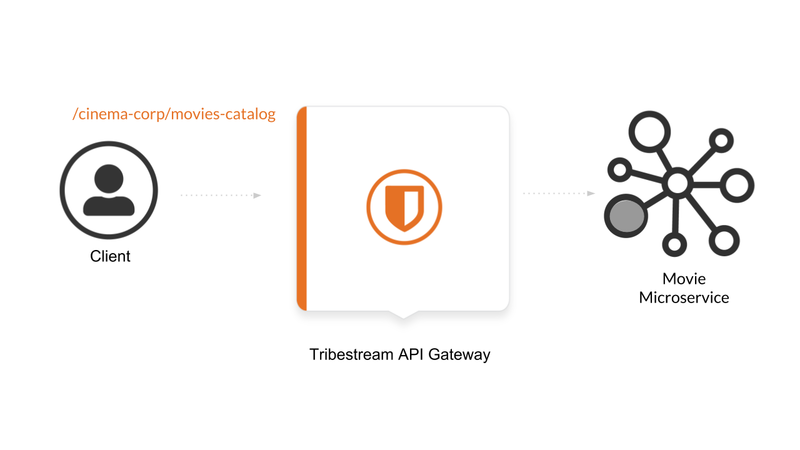 Tribestream API server who is securing the movie microservice with Authentication and Authorization. A movie microservice that contains the list of available movies in it’s database. 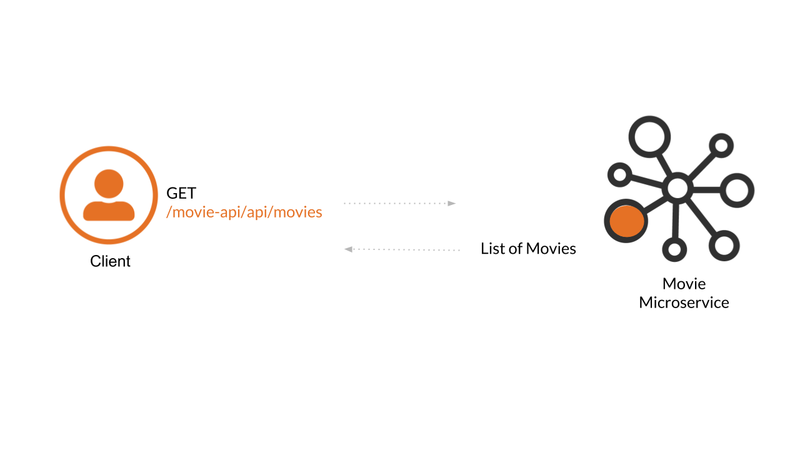 The following diagrams shows a client who obtain a list of movies form the microservice by executing a request to the movie-api/api/movies endpoint. Notice that at this point all the communication is done without security. 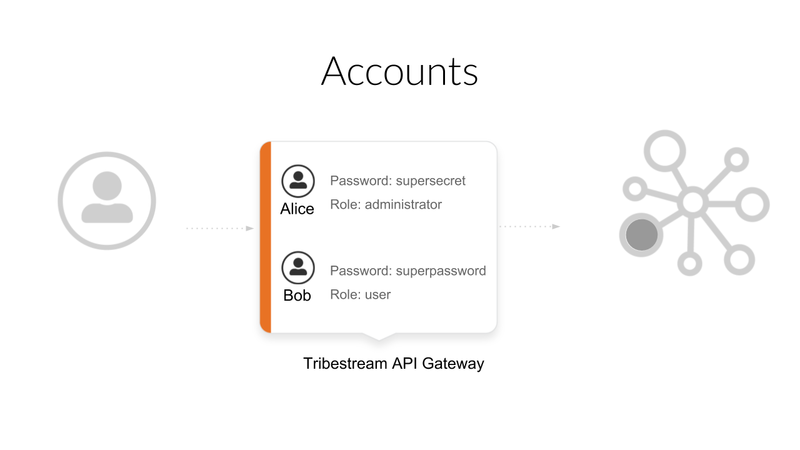 The Tribestream API Gateway is going to seat between the Client and the Microservice in order to enforce Basic Auth security to the Microservice. Other TAG features like Advance Security, Routing, Load Balancing and Monitoring are cover later in the Learning Journey. 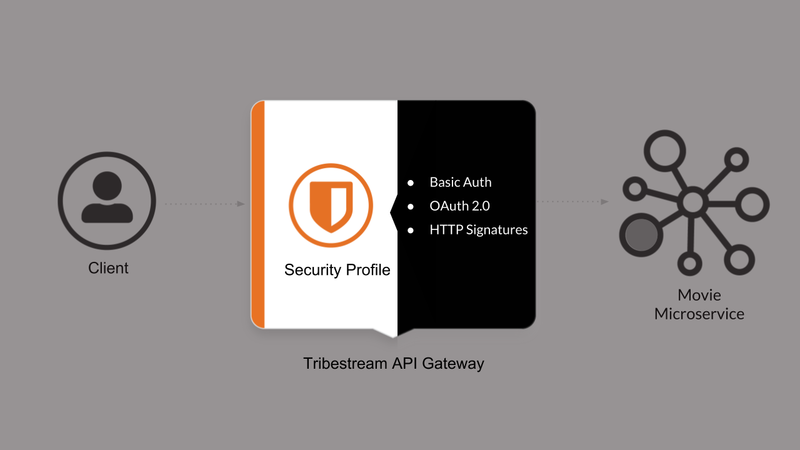 In order to secure the movie microservice we need to create a TAG Security Profile, for the purpose of demonstration we are going to use the built in Basic Auth Profile but we recommend stronger Authenticator such as OAuth 2 or HTTP Signatures which are shown later in the learning journey. For the authorization we are going to rely on TAG User Roles. 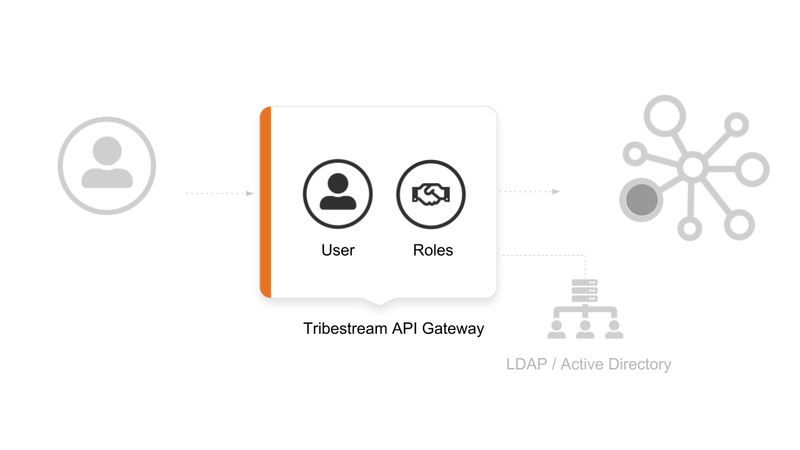 A client who want to access the microservice through the TAG, will require an Account with a User, valid credentials and one or more valid roles. 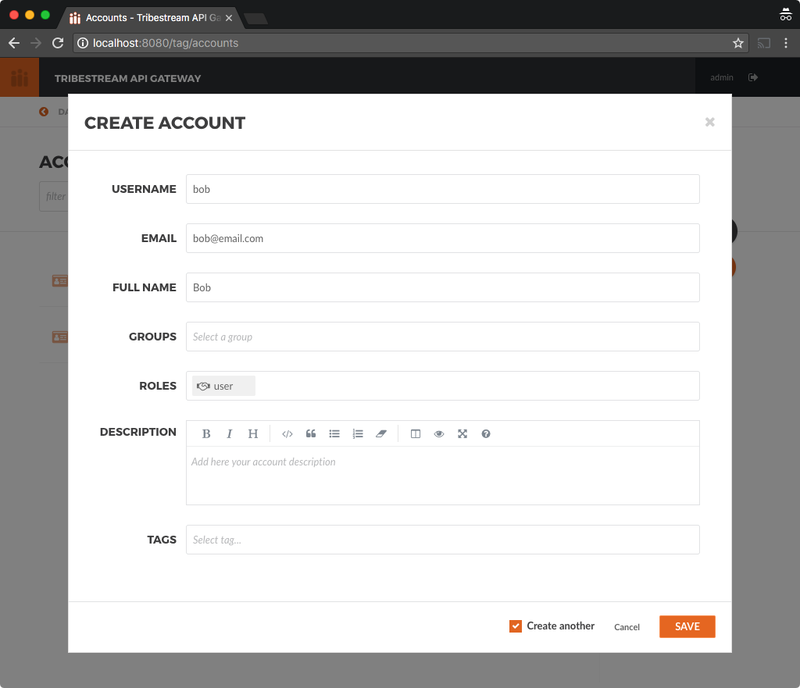 We are going to create this entities right from the TAG UI but you can also use an authorization system like Ldap or Active Directory. We are going to create two accounts in TAG, Alice is going to have the administrator role and Bob the user role. Click on the Accounts option to navigate to Accounts page, click the + button on the upper right side and select Account. Create a new account with the following data and make sure you enable the Create another check box before clicking the Save button. 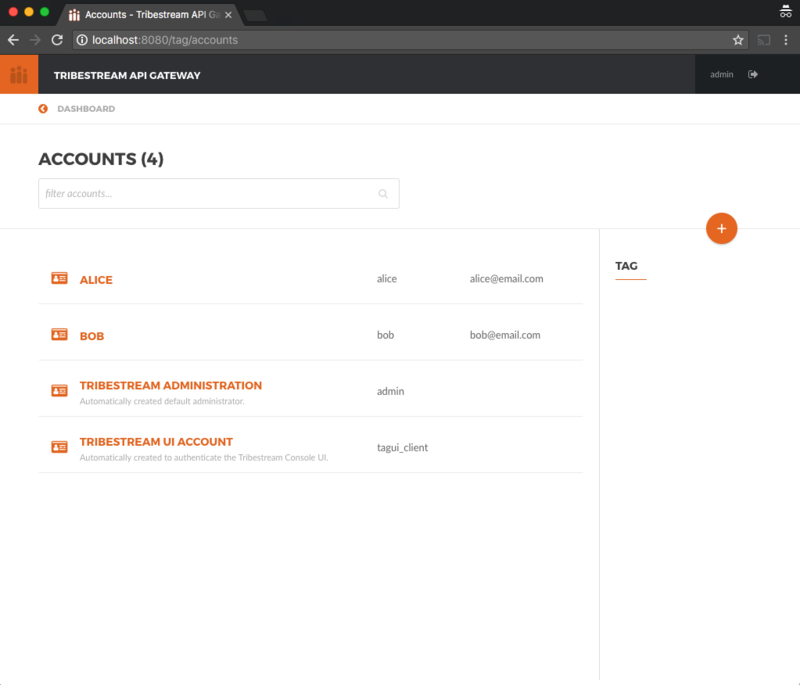 Notice that the administrator role is automatically created and assigned to Alice when you create the account. For the second account use the following data. Notice that Bob account only needs to have the role user. After filling in the data click Save button and then close the Create Account modal window. You should be able to see the two accounts as part of the list displayed on the Accounts page. Now we are going to assign a basic auth password to both accounts. From the Accounts page, click on Alice account to open the account detail page. Click the …​ button on the upper right side and select Add Password from the menu. In the Add Password modal window, type supersecret as the password and then click the Save button. From Alice account deail page go back to Accounts page by doing a click on the < ACCOUNTS option in the upper left corner and repeat the previous steps to add superpassword as the password for Bob account. 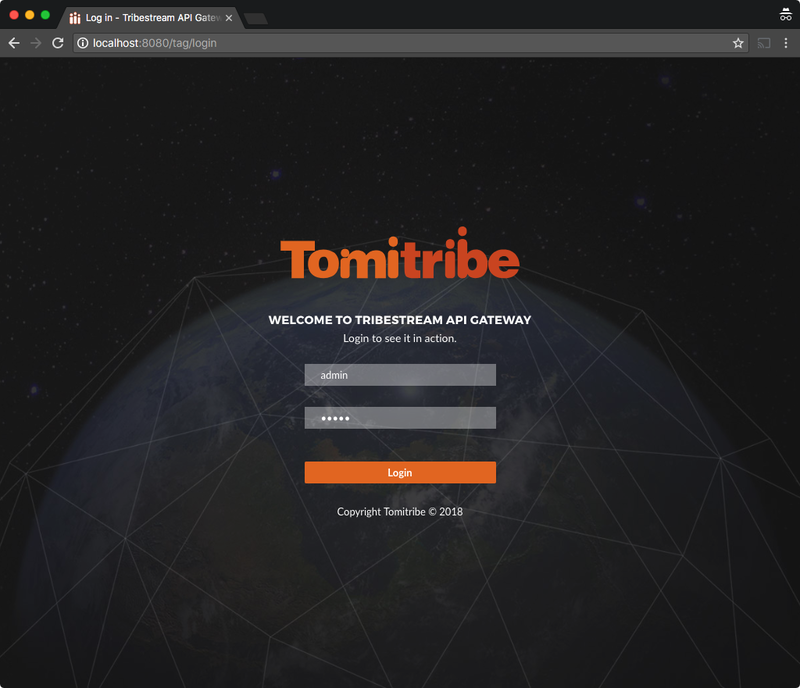 From Bob account detail page, click the Tribestream API Gateway home icon located on the upper left corner of the screen to navigate back to the Dashboard page. 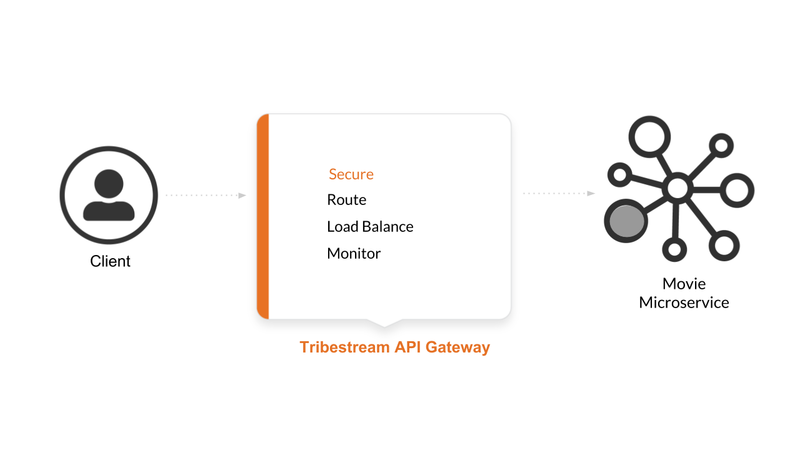 The mechanism used by the Tribestream API Gateway (TAG) to orchestrate and secure the traffic to and from API endpoints is called Route. 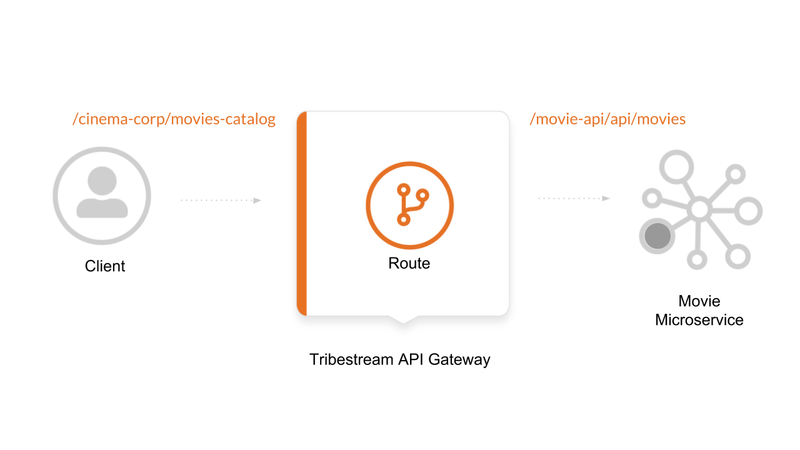 We need to create a Route that will expose in TAG a /cinema-corp/movies-catalog endpoint, that will enforce Authentication (Basic Auth) and Authorization (via administrator role) for incoming requests before routing to the actual /movie-api/api/movies endpoint. 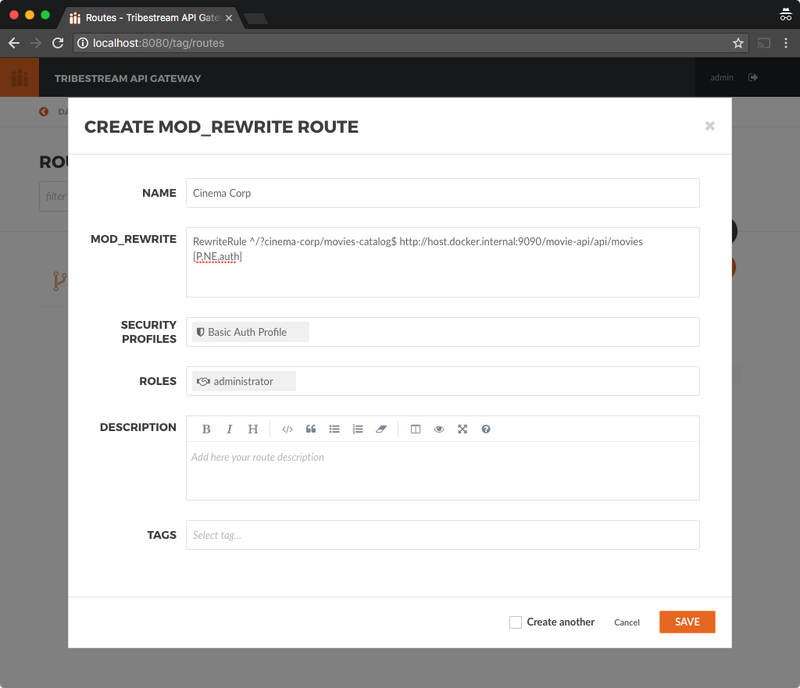 From the Dashboard page, click the Route button and then from the Routes page click the + button on the upper right side and select Mod_Rewrite Route. If you want to know more about the mod_rewrite syntax, we have more guides in the Learning Journey that will explains the syntax with details and examples. But for now we need to emphasize that the route we created is going to provide the endpoint /cinema-corp/movies-catalog in TAG and internally is going to redirect incoming request to the microservice if and only if the Authentication and Authorization is the right one in the incoming request. 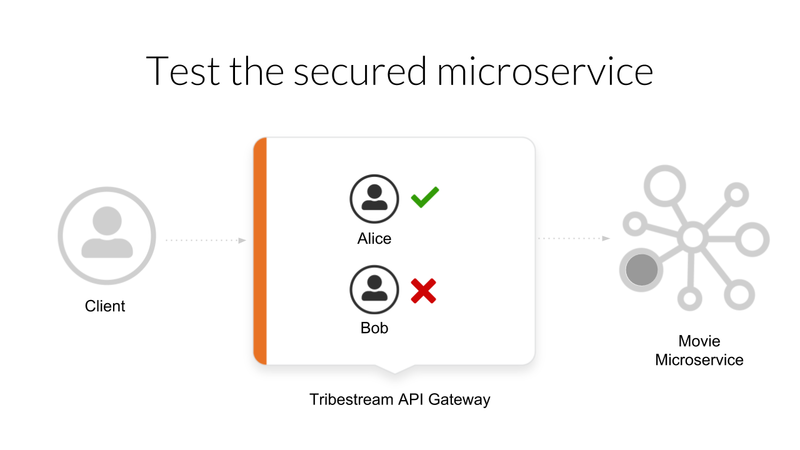 To successfully test the secured microservice you can use Alice account because it already contains the required administrator role. 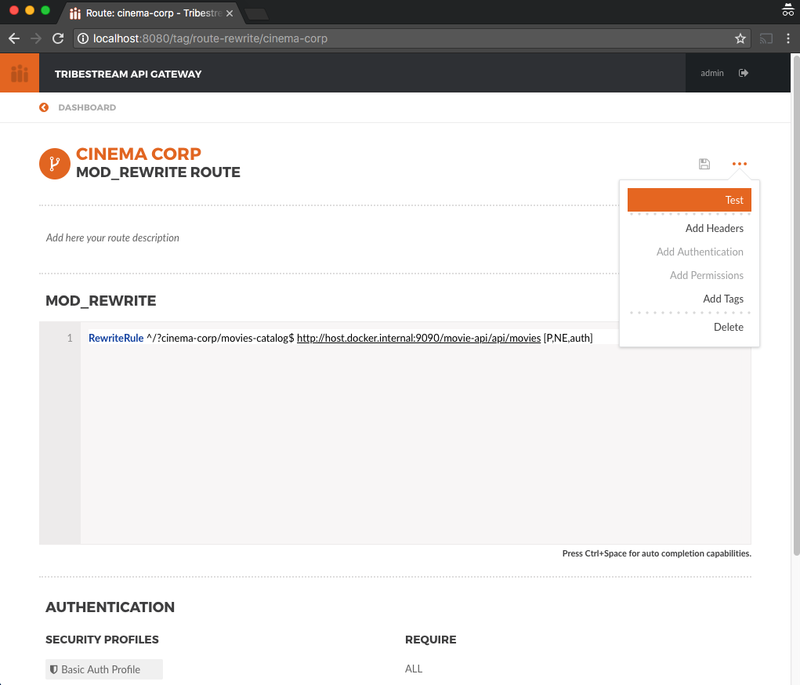 We are going to use curl command to send a GET request to the TAG endpoint /cinema-corp/movies-catalog we configured on the route and we are going to use basic auth to authenticate and authorize Alice request. You can also test the TAG routing, authentication and authorization right from the Cinema Corp Route detail page. 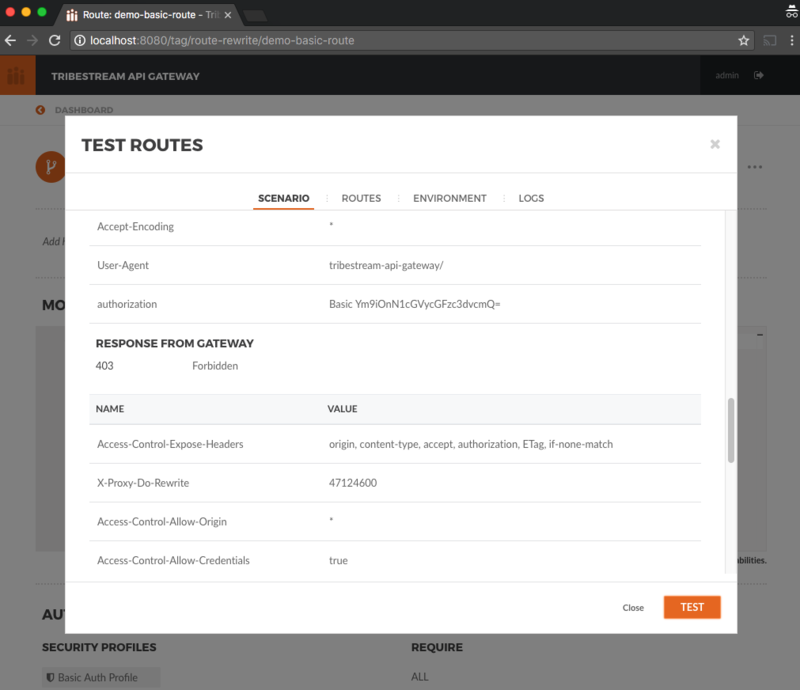 For this you need to open the Test Routes window by clicking the … button at the top right corner and then selecting the Test option. 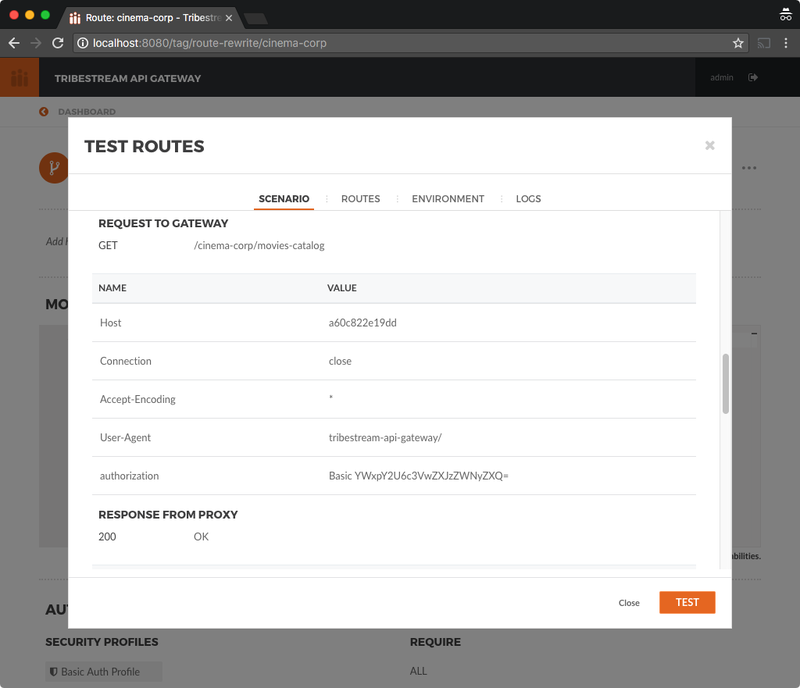 You will be able to see the 200 HTTP Response code along with details about the routing applied by TAG for the requests. This time you will see the 403 HTTP response code along with the details about the routing applied by TAG for the requests. Since both the TAG and the microservice were created with a specific container name, you can now stop both containers. On a terminal execute the following command.